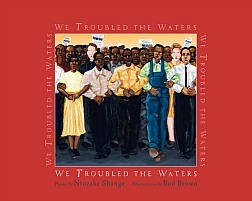 In startling verse and paintings, Ntozake Shange and Rod Brown tell the stories of the pain and suffering experienced before the Civil Rights Movement, the actions and leaders that led to historic change, and the vision of America as a country where race and religion no longer separate Americans. Individual poetic and visual tribute is given to the heroes from Booker T. Washington, Rosa Parks, Martin Luther King, Jr. and Malcolm X. The authors remember and honor those unknown Americans who were also part of the Civil Rights Movement--- the school children who learned and used their education to build up themselves, the cleaning woman and the garbage boys, and all those who stood up in protest. Ntozake Shange and Rod Brown bring together powerful images of familiar history to those who lived through these times. WE TROUBLED THE WATER makes history come alive, allowing the reader/viewer to feel the suffering and the courage of those who lived through that time. WE TROUBLED THE WATER strikes the emotions in a very visceral way. The images and verse about real historic figures provide an educational resource for children (ages 9-12). Several lesser known historical figures (Marcus Garvey and Bull Connor) are mentioned, giving direction for those inquisitive readers who want to explore more history of the Civil Rights Movement. Some of the most compelling and shocking images emerge from the authors use of nature in the beginning river scene, "Crying Trees" and "Road Kill." These images trouble one deeply and yet few images anywhere capture the emotion behind the suffering and call for justice as these do. These images and words are not for the faint of heart. They haunt and trouble even those adult readers familiar with the Civil Rights Movement from study and having lived through those times. WE TROUBLED THE WATER is a powerful, emotional look inside an important part of American history. WE TROUBLED THE WATER reaches that poetic place inside a reader/viewer, that quiet place that recognizes suffering and cries out for justice. WE TROUBLED THE WATER is an important resource for teaching American history because the images and poetry bring alive the very heart of the period in a way an academic text is unlikely to do. WE TROUBLED THE WATER shows the power, energy and vibrancy in history and society. WE TROUBLED THE WATER would also be a great choice for the bookshelves of those adult readers who lived through these times. Few books capture the suffering, struggle and hope as well. WE TROUBLED THE WATER would be a great resource for parents and grandparents to share with their children and grandchildren, reading aloud and sharing their memories of this period. Whether this book is used as a resource for teaching or during Black History Month celebrations or read by individuals and families, WE TROUBLED THE WATER is unforgettable. A keeper!